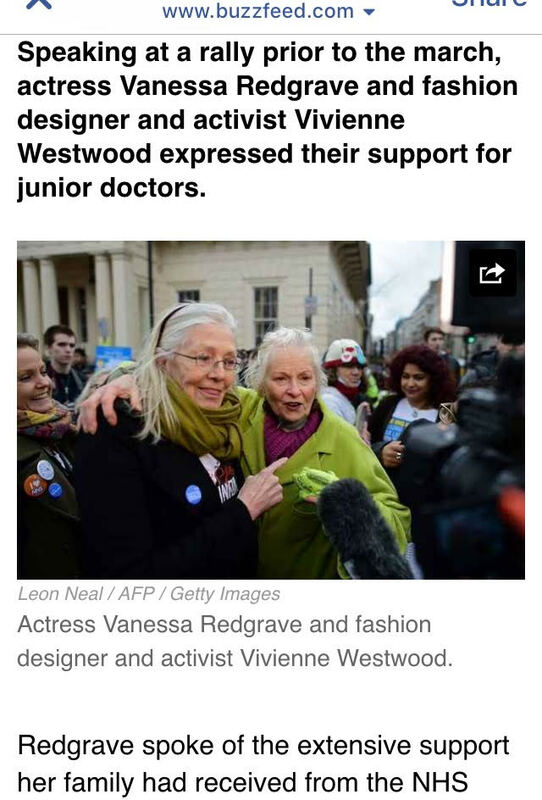 Buzzfeed News 06.02.2016/ Vivienne Westwood and Vanessa Redgrave Joined Thousands of junior Doctors Marching to Downing Street. By Laura Silver. The Guardian 06.02.2016/ Vanessa Redgrave pays tribute to NHS staff at junior doctors rally. By Press Association. Vice News 06.02.2016/ Thousands of Medical Workers Protest Pay Cuts and Longer Hours in London. By Sally Hayden. Evening Standard Ross Lydall 19.08.2016/ Westwood’s Protest T-shirts raise > £5000 for charity.